Also Shane you're an enigma. Shitting on the 9900K but getting a 9940X?! 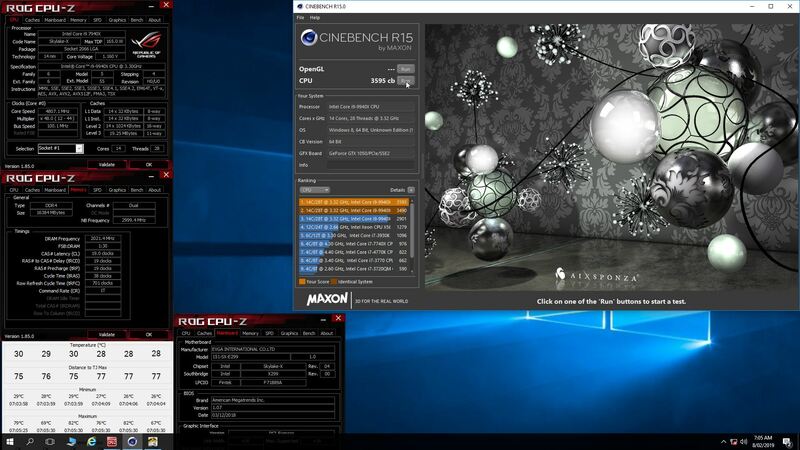 Headin has confirmed also 9900K & his is reliable for 51x watercooling. My ambient temp are more than him in Qld. Average benchmark comparisons show that the 9940X has roughly 60% higher integer and fp multicore performance. It's also $2000 just for the CPU. Right, so he only bought the one. Seriously though, clearly he's aiming for a unique goal which is to get the absolute highest benchmark, not put together the best multicore system for normal desktop use on a budget. The 9900X is not as good as the 9940X for that purpose. I am working on a review of the Gene at the moment, and went through the same process chatting with my Asus contact. Basically, the Maximus XI series use what is socket sense for the voltage readings. In the past, it has been Die-Sense which goes through extra relays. The Z170 MOCF used this same sensor reading, so it's not a new thing. Sure, it will show or seem to need less voltage, but when you boil it all down, it ends up requiring the same real voltage regardless. Correct. I was the wrong way around. Teach me to check my facts before commenting. Do you feel it’s really an improvement? It only helps give a clearer actual reading, there is no real benefit to real voltage needed. Where it is better though is LLC8 on XI boards is a near perfect voltage (ie, bugger all droop) where on Maximus X boards, LLC6 even overshoots. LLC8 is stupid and LLC5 gives a small droop. That in itself is winning in my opinion. 1dongchen and DarkSnipa like this. What is the current price in AUS for a 9900k? I can get for $690sgd in Taiwan ($717aud). I don't know where people price check in AUS now. Still over 800AUD even if you source it from Newegg, I got my 9900K around 3200CNY (~$670 AUD) when I was in China but it is an OEM one. If it is a retail 9900K then it is pretty good. Correct. A processor to do team scores, not personal use. 9900x hmm more turned of defective cores. Either 10,12,14 tough deciding. Note I don't care for low volt tuning, I'm pulled down from 5Ghz in the Evga OC app. High Ambient. Lets get this one out of the way shall we My purchase is about the most grunt, less heat. This guy is a sensational overclocker. 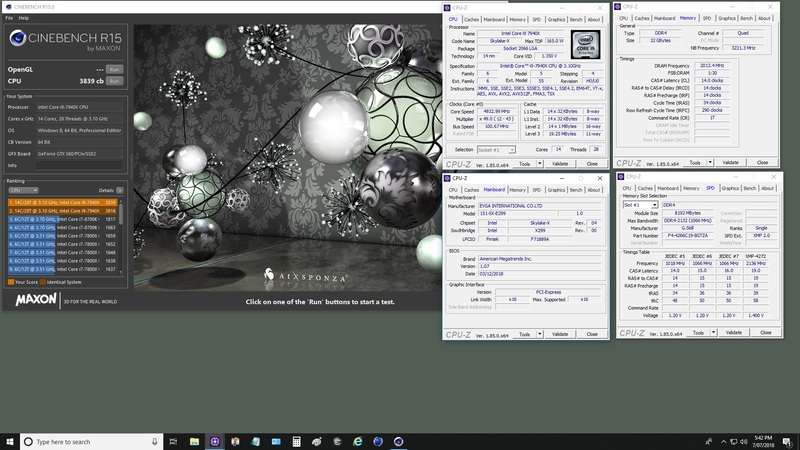 he's done the 3D scores with a 9900K @ 52x 1.4V. As Headin tests his 9900K, I cannot cool it. He has volt modded gpu's, I'm not doing that to mine. 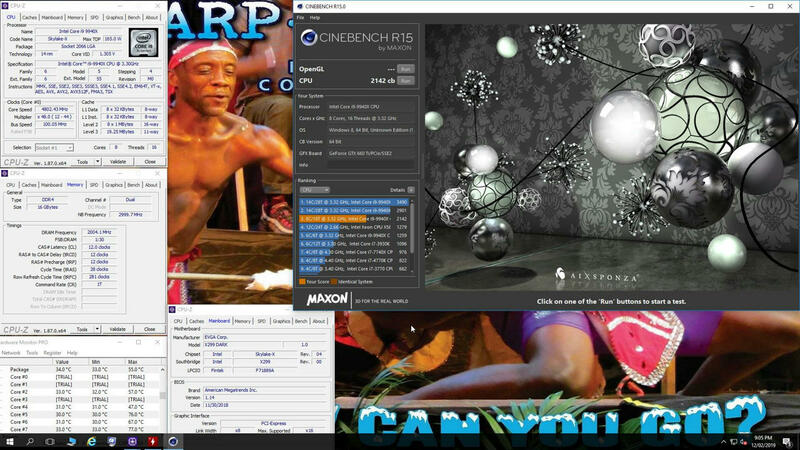 So if you decide you want good scores, match him 9900K ... there is no way on this earth you will beat his scores. How much time will you spend fine tuning? 3hrs? More? Still will hit under the mark. How much time will you spend fine tuning? Haha ... yeah we could save a ton of money there. A dual core & ATI basic video card from the last 5 or so years. how are you liking the HoF ram?